Reviews matter. For example, today’s savvy consumer is likely to use Trip Advisor or Kayak when shopping for travel. Likewise, according to Caring.com research, consumers are influenced by reviews of senior housing communities and home care companies. A listing with one or more reviews is 14 times more likely to convert to a lead than one without a review. Seek reviews from your residents, customers and family members and have a plan to include them with your listings. 2. Pay attention to your star rating. Consumers will pay attention to your star ratings! Consumers search by reviews and by the number of stars attached to your listing. If there are no stars, a consumer wonders why you are not rated and may drop you from their contact list. 3. Show off unique features of your community. Think about the features that set you apart from your competitors — a mountain or water view, koi ponds, pets, a miniature train, a soda fountain. Descriptive words about unique features can drive readers to contact you. For directory listings, a well-staged photographic tour of your community drives better listing results than photos of smiling residents and their family members. An adult child decision-influencer seeking options for a loved one’s housing is more likely to respond positively to an empty room than a room with one or more people in it. A 2008 study by direct marketing agency, Millennium, found that 55% of people over 50 believe that advertising treats them in a patronizing manner. A Boomer woman making a decision to move her mom into a community is likely to be more attracted to a beautiful space without people in it because she is able to picture her mom in it. A photo of a space with smiling older people in it may seem “unreal” and evoke negative emotions. Conventional wisdom in the senior housing and care professions has been to keep rates out of a listing. However, your lead will be more likely to convert if you simply publish your “starting rates” (as opposed to all of your rates) in your directory listing. 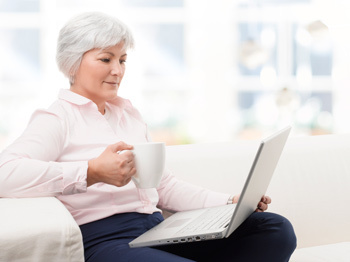 Caring.com is the web’s #1 source for senior care reviews. We help families find information, support, and local services to help with their caregiving journey. We also help senior service providers connect with the families who need them. You can reach Katie Roper at Katie@caring.com.